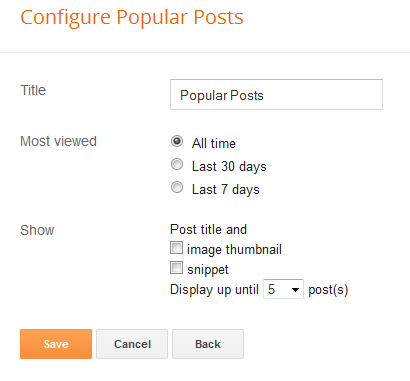 Blogger allows us to easily add a "Popular Posts" widget, that we select from its list of gadgets, and we can do that by going to the "Layout" of our Blog. 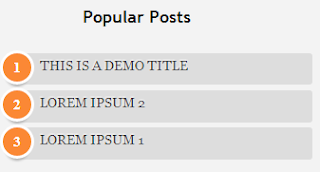 This gadget, as the name implies, shows which are the most visited blog posts, and you can set it to display the info you want in four possible combinations: (1) only the title of the post, (2) a thumbnail of the image and the post title, (3) post title with a summary, and (4) post title with a thumbnail and a post snippet. This is an element that you shouldn't miss in your blog because it encourages your visitors to navigate through your content and that can result in higher income if you're monetizing your blog because it would generate an increase in the number of pages visited, and in turn, can attract the users' interest to subscribe to the blog and to read interesting content. Preliminary steps: Add the gadget, if you haven't done it yet. 1. 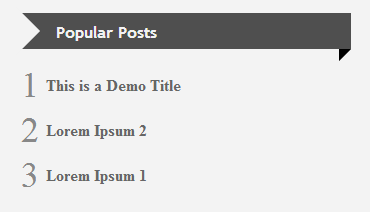 Select the "Layout" tab and add the "Popular Posts" gadget in that part of your blog you want to appear, such as in your sidebar, by clicking on "Add a Gadget". 2. Configure the widget to show only the post titles. You can do this by clicking on the "image thumbnail" and "snippet" checkboxes, as shown in the following image. 3. After configuring the widget, save the changes by clicking on Save, and then Save arrangement. 1. Choose a style, then copy the CSS that appears below the image that shows the style. 2. Select the "Template" tab, then click on Customize > Advanced > Add CSS and then paste the CSS style that you like the most. 3. 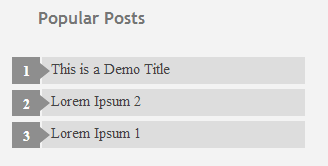 Once you add the CSS, Save changes by clicking on the "Apply to Blog" button. And that's it! 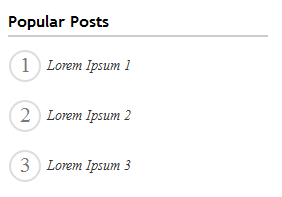 You've already customized the popular posts widget when it shows only post titles. All the CSS is valid. I just have to mention that the numbering is not visible in Internet Explorer 7, since that version of the browser does not support properties that make the numbers appear. For example in the 4th style, the circles look squared in IE8 and earlier versions since, these versions do not support a property that makes them look as circles.